it’s preservation of your oral health and total well-being. 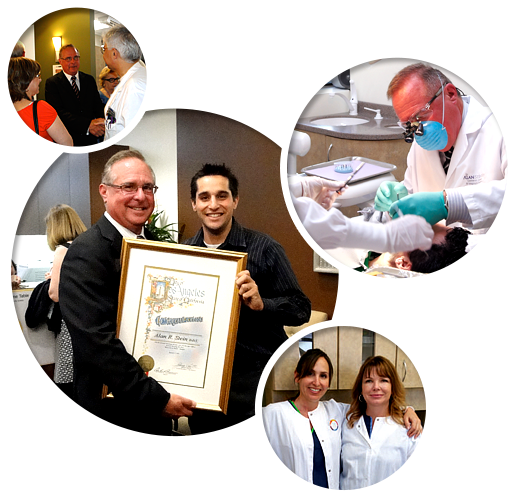 Dr. Alan R. Stein is renown throughout the San Fernando Valley for his commitment to the community and his excellence in dentistry. It’s his personal warmth, attention to detail and patients-first philosophy that keeps our practice thriving and patients happy. From basic check-ups and dental cleanings to implant dentistry and full-mouth reconstruction, patients of Dr. Stein recieve the highest quality dental treatment in a relaxed, comfortable environment. We are a full service dental office providing the most current trusted technology such as low dose digital xrays,3-D computerized dental modeling, pain-controlled anesthesia and more. Our staff is licensed and always ready to assist in making the dental experience a pleasant one. Contact us to learn more about your treatment options at our Northridge dental office. Find out how to replace missing teeth without a denture, partial denture or bridge work. Use our mobile app to enhance your dental experience. Care, contact and convenience at your fingertips. 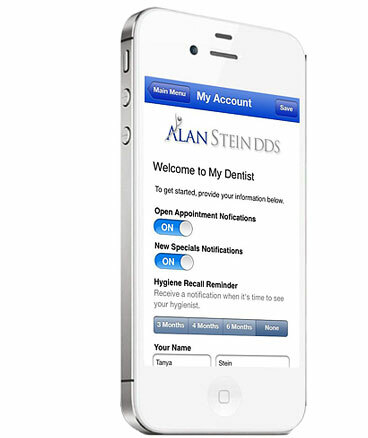 Our mobile app can be downloaded from the, Apple or Google Play Store under Alan R. Stein DDS. Dr Stein and his staff are always great. Dr Stein makes going to the dentist painless! I have been going to him for over 30 years and highly recommend him. extra buck :-) A+ plus on my books! Excellent service and clean office. Staff is genuine and professional. Dr. Stein is a great dentist who makes the effort to know his patients. They make every effort to get you to visit the dentist regularly. Making appts are easy and they send reminders. It's just an overall great experience. BEST dentist! I am a big baby when it comes to dental offices. I use to get nervous and feel faint at times just sitting on those uncomfortable chairs waiting FOREVER for the dentist. Not anymore! The office manager & staff provides EXCELLENT customer service! The office is clean, modern, inviting and state of the art equipment! I look forward coming back! Thank you Dr. Stein & staff for taking care of me! HIGHLY recommend this dental office! The BEST!